TWO NEW MISCLASSIFICATION SUITS AGAINST UBER: Uber’s recent $100 million settlement of two misclassification lawsuits in California and Massachusetts didn’t end its legal troubles. On Monday Uber drivers sued the company in Florida and Illinois, once again alleging misclassification. 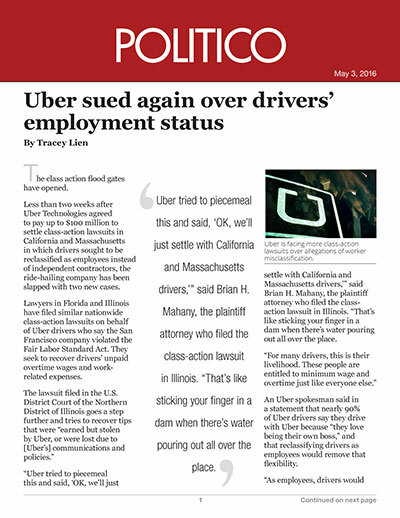 “The lawsuit filed in the U.S. District Court of the Northern District of Illinois goes a step further and tries to recover tips that were ‘earned but stolen by Uber, or were lost due to [Uber’s] communications and policies,” the Los Angeles Times’ Tracey Lien reports.